When you’re traveling with a little one who’s still in diapers, air travel can offer a few extra challenges. Many little ones react to the stresses of travel in ways similar to adults — and one of those ways happens to be exhibiting an upset stomach. Even if your kiddo is not one to experience travel jitters, you know that if he/she is ever going to encounter a stomach bug of any kind, it’s absolutely going to happen when you’re half way through a cross country flight. For this reason, do yourself a favor and bring a portable changing pad as well as one diaper for every hour you’ll be flying, plus a few extra for layovers/delays. For a 4 hour flight, I bring 8 diapers total in my carry on — one for each hour of the flight, one for pre-plane, one post plane, and two as a contingency against delays. Change baby’s diaper right before boarding to give yourself the best shot possible of avoiding the need to change him again once on the plane. And for the love of all that is holy, do not feed him anything that you know will “go right through him.” (I’m looking at you, Lara Bars). Now look closely. See that little folded table top above the toilet? That’s the changing table. So if you’re changing the diaper of a preemie, you’re all set. Baby will fit up there just fine. But if your baby falls outside of the 5th percentile for height and weight? You’re going to struggle. The first time I had to change Matteo’s diaper in flight, he was 7 months old. And while he was a normal sized baby, he was also a baby, which means he moves and cries and grabs his feet and does not want to lie on a mini sized changing table that’s oddly square shaped. All that said, he cried and didn’t like it but I was able to change his diaper fairly easy. Same story for when we flew with him at 10 months, though there was noticeably more crying and screaming (from both of us) leading to several stares from our fellow passengers when we exited the bathroom. By the time we flew with Matteo at age 1, though, the changing table was no longer usable. He was just too long, and freakishly strong, to lie on that little square shaped table. So enter Plan B. Lower the toilet cover, sit down and use your legs as a changing table. Pray to God you’re changing a wet diaper and nothing more. If there is something more, then be thankful that you remembered to bring the portable changing pad and hopefully you can save yourself from too much mess during diaper changing. If you’re traveling with a spouse, and if you really dislike your seat companion, you can also make the horrible-yet-sometimes-necessary decision to change baby right there in your seats. Tread lightly here though, and don’t even attempt this trick if you think you’re dealing with anything more than a wet diaper. Seriously. People pay a lot of good money to fly (not us, of course. points, holla!) 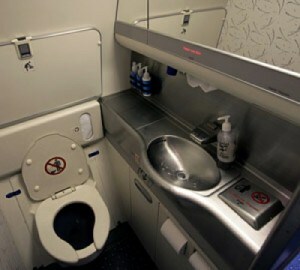 so don’t treat the airplane like the vaguely-hippie-seeming-family-bathroom at the mall. Other advice? Be smart. Bring a change of clothes for the kiddo and keep it easily accessible in your carry on. For you, wear dark colors in fabrics that don’t show water spots (solid black cotton top and dark wash blue jeans are my go to travel clothes) so that no matter what happens in flight, you don’t have to deplane looking like a complete bum. And keep in mind — the flight is the least important part of your trip. So it goes terribly? Good, you just got all the bad mojo out early for the entire trip ahead. Get off the plane, regroup, and enjoy your vacation.